Although human beings are born with the innate ability to squat, it can be easily lost through a lack of practice. The ability to squat is also important for health reasons. 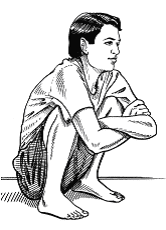 Contrary to Western ideas about toilet design, human beings were not designed to evacuate waste in the sitting position. "The ideal posture for (elimination) is the squatting position, with the thighs flexed upon the abdomen. In this way the capacity of the abdominal cavity is greatly diminished and intra-abdominal pressure is increased, thus encouraging expulsion." However, as a result of a confluence of factors/events in history -- the idea that sitting is more dignified and 'civilized' than squatting, the invention of sitting toilets and the availability of indoor plumbing in the mid 19th century (the Industrial Revolution) -- one third of humanity has ended up abandoning the habit of squatting. Today, with a few exceptions (eg: France), it is virtually impossible for a visitor to find any squat toilets in Western countries. The habit of sitting for defecation has given rise to a strange defining characteristic of Western peoples: about one in three adults (according to one study) is not able to to maintain the squatting position for more than thirty seconds. "I am now an official squatter. Just finished my first two days using the new way. I had to to stretching and strength exercises in order to do it because several years ago I had a tibia plateau fracture (very severe, two screws) to my left leg. If I can do it, anybody can do it." The use of sitting toilets can be dangerous because in the sitting position, it is physically impossible to empty the colon completely. Unknown to many, the long-term use of sitting toilets has been linked in numerous studies to the growing epidemic of colon, bladder, prostate and pelvic-related health problems in Westernised countries. If you have some difficulty in squatting, place one (or two if necessary) tall-back chair at your side, and hold on to it for support. Or you could practise squatting with a big exercise ball placed between your back and a wall. Aside from squatting, there are also other forms of exercises that can improve the flexibility, sense of balance and strength required for squatting. Yoga exercises are especially beneficial in helping a person regain the ability to squat again. The practice of yoga increases the natural flexibility of the body, and also strengthens the muscles needed to facilitate the squatting position. Like yoga, Pilates strengthens the entire body. Hold on to a chair and stand with your feel about hip's width apart. Keep your back straight and your pelvis tucked under your body. Slowly lower your body, keeping your feel flat on the floor. Hold for a count of ten and slowly stand back up. Stand holding onto the chair, back straight, pelvis tucked. Slowly lower yourself. As you lower your body, rise up on your toes and go down as far as you can while keeping your back straight. You can hold there and in several other positions going up or down if you wish. Slowly raise yourself. First position is heels together, toes pointed outward. Second position is feet about hip width apart with toes pointed outward. Third position is rarely used. Fourth position is toe to heel in the shape of a seven, either correct or backwards, depending on the lead foot. Fifth position which is toe to outer instep, forming a sort of "T". There are few things in life that with so little effort required on your part, could have such a profound and positive effect on your health. By learning how to squat again, and then deciding to switch from sitting to squatting for your bowel movements, you would go a long way towards prolonging and improving the quality of your life.